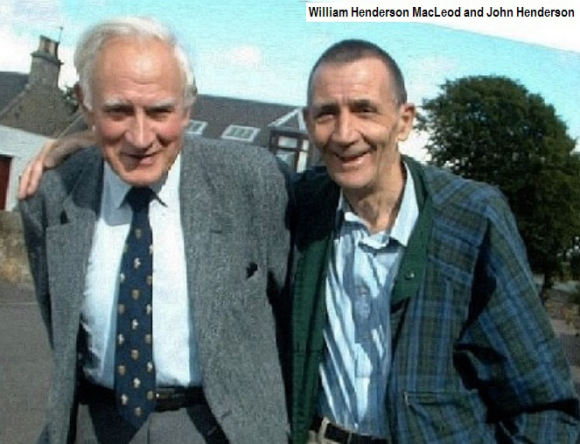 "John Henderson [Headteacher] and William Henderson MacLeod [Engineer] were 5th cousins 1 time removed. Their common ancestors were James Henderson and Elspeth Ingles who married on the 24th of June, 1731 in Wemyss, Fife, Scotland. Their son, Andrew born 25th December, 1735 in Wemyss was my Great x 4 Grandfather, and his brother William, born 13th October, 1746 in Wemyss, was William Henderson MacLeod's Great x 3 Grandfather." A son of this William Henderson, born 1746, was William Henderson (Engine Wright to Lord Wemyss), born 1788, Wemyss - died 1845, Wemyss, whose daughter Margaret Henderson, born, 1827, Wemyss, married James MacLeod in Wemyss in 1852, to live the rest of their lives in Kirkcaldy until 1885 and 1909 respectively. Subsequently 'Willie' and I conversed regularly by e-mail and telephone as well meeting at his home every other Spring, when, on my trips home to Scotland from Cyprus, we, together with his wife Betty, shared many a happy day of reminiscing and meals out in North-East Fife, until, sadly, in 2011, both these fine cousins passed away within months of each other in a residential home in St Andrews. 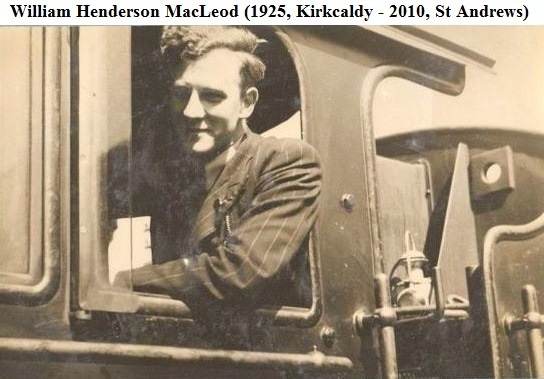 Apart from his professional career, [that I summarise below], Willie's main recreational interests encompassed a passion from boyhood for all Britain's railways and their engines, social and industrial development in his native Fife, family trees, North and East Scotland doric languages, and home gardening. Thus we shared many engrossing 'touching points'. In 2007 Willie sent me some notes about his working life, and, typically, he gave these a pawky title .... 'My Stoory Mountain'! Basically my 'Curriculum Vitae' comprises a pile of paper notes, -not gold nuggets within which any doctorate sources may lurk. Indeed, these documents are largely copies of reports and submissions to Management during my times with the (NBL) North British Locomotive Company, Guardbridge Paper Mill and James River of America. At NBL I was extremely lucky, other than financially, as one of relatively tender years, to be moved around many interesting jobs. After Director of Operations experience on locomotives for Estoril (Portugal) and Ceylon, and also underground Mine Locomotives, I worked as Leading Hand Draughtsman on an experimental Coal Burning Gas Turbine Locomotive for the Ministry of Fuel And Power. Thereafter at NBL I was switched to the job of Chief Hydraulic Test Engineer on hydraulic transmissions –my predecessor, who had been sacked on the spot, had destroyed all records! I was taken off that job just when it was up and running and became Assistant to the Works Director. This included Works Overheads' Control, and overall surveillance for the Director of the last steam locomotive to be built by the Company v.i.z a sub-contract Garratt Locomotive for South African Railways. Nextly, I was sent as Assistant Works Manager to a shop manufacturing Marine Steam Turbine Components [Sub-assemblies under licence for W.H.Allen of Bedford. Then, in the same works, and as Assistant Manager I had to set up and run a shop manufacturing Underground Mine Plate-Belt Conveyors under the technical direction of an absolutely brilliant engineer who had the largest compendium of swear words that I have ever come across. At the same time as this I was asked by the Works Manager, (Commander Hughes, RN, Retd. -an old Sub-Mariner) to keep an eye on the Flanging Shop that turned out a range of heavy boiler flangings. Then I was hauled out of that just when it was settling down reasonably and drafted to Queens Park Works as Assistant to the Manager responsible for all Works Services, v.i.z. Maintenance (Mechanical/Civil/Electrical); Stores; Yard and Works Progress! However, a little later, just as NBL was starting to founder, I was appointed Works Manager of a shop being set up to manufacture Steam Turbines. In due course, a consortium of Government/Clydesdale Bank & The General Electric Company of Great Britain took over NBL, and the turbine project immediately vanished .... as did several of the Company Chief Executives! The consortium gave me the job of compressing the company’s three works into one, i.e. Queens Park Works. I thus selected/procured desired equipment and drew up a plan for plant movement and overall concentration, while overseen by the Government’s agent Lord Reith, the Bank’s agent Sir Harold Yarrow, and GEC's agent Sir Arnold Lindley. With concentration completed I was given the job of Production Controller in the new plant - but it turned out to be a stupid job of carrying the can with no direct shop control! 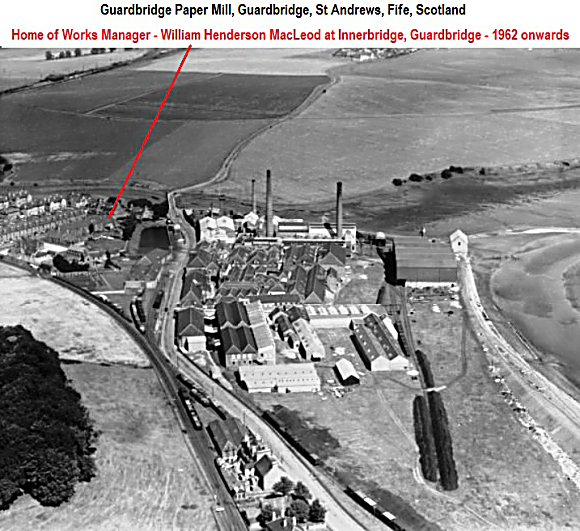 I took the job but immediately started to look around for some escape route, and was delighted to see an advertisement for a Workshop Manager at Guardbridge Paper Company. I got the job and started at the beginning of 1962. Later in 1962 I was sent to the USA and Canada in connection with a new cutter, which, in due course, I saw commissioned at Guard Bridge. I took over from the Chief Mechanical Engineer at Guardbridge when he retired in 1970, whereafter I was confirmed as Chief Engineer, the job I held until I retired on my 65th Birthday in 1990. Sweden, Germany, Switzerland, France, Belgium and Italy as well as elsewhere in the UK. Later on, alone, I also undertook a fact-finding mission to Norway. Still with regard to energy work, I later visited various plants in Detroit, Philadelphia and Green Bay, Wisconsin. After retirement, I accepted a self-employed contract with the company as the Project Engineer for a new Effluent Plant and successfully supervised its commission before eventually deciding 'enough was enough'!